Mangalampalli Balamuralikrishna (Telugu: మంగళంపల్లి బాలమురళీకృష్ణ; 6 July 1930 – 22 November 2016) was an Indian Carnatic vocalist, musician, multi-instrumentalist, playback singer, composer, and character actor. He was awarded the Madras Music Academy's Sangeetha Kalanidhi in 1978. He has garnered two National Film Awards (1976, 1987), the Sangeet Natak Akademi Award in 1975, the Padma Vibhushan, India's second-highest civilian honor in 1991, for his contribution towards arts, the Mahatma Gandhi Silver Medal from UNESCO in 1995, the Chevalier of the Ordre des Arts et des Lettres by the French Government in 2005, the Sangeetha Kalanidhi by Madras Music Academy, and the Sangeetha Kalasikhamani in 1991, by the Fine Arts Society, Chennai to name a few. Balamuralikrishna started his career at the age of six. Up to the present time, he has given over 25,000 concerts worldwide. He accompanied Pandit Bhimsen Joshi, and gave jugalbandi concerts with Pandit Hariprasad Chaurasia , Pandit Ajoy Chakrabarty and Kishori Amonkar, among others. He is also known for popularizing the compositions of Sri Bhadrachala Ramadasu and Sri Annamacharya. Balamuralikrishna's concerts combine sophisticated vocal skills and rhythmic patterns of classical music with the popular demand for entertainment value. Balamuralikrishna has been invited to give concerts in many countries, including the US, Canada, UK, Italy, France, Russia, Sri Lanka, Malaysia, Singapore, Middle East and many more. Apart from his native tongue, Telugu, his works also include ones in other languages like Kannada, Sanskrit, Tamil, Malayalam, Hindi, Bengali, and Punjabi. Balamuralikrishna was born in Sankaraguptam, East Godavari District, Madras Presidency (now a part of Andhra Pradesh state). His father was a well known musician and his mother was a veena player. Balamuralikrishna's mother died when he was an infant and he was raised by his father. Observing his interest in music, his father put him under the tutelage of Parupalli Ramakrishnayya Pantulu, a direct descendant of the shishya parampara of Tyagaraja. Under his guidance, the young Balamuralikrishna learned Carnatic music. At the age of eight, he gave his first full-fledged concert at a Thyagaraja Aradhana in Vijayawada. Musunuri Suryanarayana Murty Bhagavatar, a Harikatha performer, saw the musical talent in him and gave the prefix "Bala" (lit. child) to the young Balamuralikrishna. Characteristic of Balamuralikrishna's musical journey has been his non-conformism, spirit of experimentation and boundless creativity. Balamuralikrishna has experimented with Carnatic music system by keeping its rich tradition untouched. 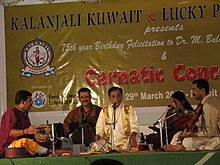 Ragas like Ganapathi, Sarvashri, Mahati, Lavangi etc. are credited to him. The ragas which he invented represent his quest for new frontiers. Ragas like Lavangi are set to three or four notes in ascending and descending scale. Ragas created by him, like Mahathi, Lavangi, Sidhdhi, Sumukham have only four notes; while Ragaas created by him, like Sarva Sri, Omkaari, Ganapathy have only three notes. He also innovated the tala system. He has incorporated "gati bhEdam" (గతి భేదం) in the "sashabda kriya" (సశబ్ద క్రియ) (actions in Talas, which can produce sound/shabda (శబ్ద) are called sashabda kriya - సశబ్ద క్రియ) part of the existing Tala chain, thus throwing open a new chain of Tala system. Saint Arunagirinaadhar used to inject such systems in his famous Thirupugazh, but only as Sandham, while Balamuralikrishna is known to be the pioneer in bringing such Sandhams into a logical rhythm, with Angam and definition. Thri Mukhi, Panchamukhi, Saptha Mukhi and Nava Mukhi are the basic classifications he has for his New Tala System. He gave his authorisation to S. Ram Bharati to found "Academy of Performing Arts and Research" in Switzerland and is also working on music therapy. He established the 'MBK Trust' with the objective of developing art and culture and for carrying out extensive research into music therapy. A dance and music school, 'Vipanchee' is a part of this Trust. Balamuralikrishna has over 400 compositions to his credit and is one of the very few people to have composed in all the 72 Melakarta Ragas and has created several ragas, with 4 notes and 3 notes and also has invented a new Tala system. His compositions encompass every facet in Carnatic Music that includes Varnas, Krithis, Thillanas, Bhavageethas. 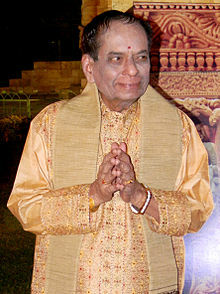 Balamuralikrishna has sung in several films in Telugu, Sanskrit, Kannada and Tamil. He made his acting debut with the Telugu film Bhakta Prahlada (1967) as Narada, and has acted in few films in Telugu and Tamil. Balamuralikrishna died at his residence in Chennai on 22 November 2016; he was 86. His end came in deep sleep at around five in the evening, due to a cardiac arrest. He was cremated with full state honours at Besant Nagar Crematorium in Chennai the very next day. Thousands attended his funeral. He is survived by his three daughters, and three sons who are all Doctors. His wife Annapurna also outlived him for three months, and died on 16 February 2017. A documentary film, The Melody Man, was made on his life by the Government of India Films Division. The film was directed by National award winner Director Gul Bahar Singh. Balamuralikrishna acted in few films and gave his voice to some selected songs in Indian cinema. ^ "Carnatic musician Balamuralikrishna passes away". The Hindu. 22 November 2016. Retrieved 22 November 2016. ^ a b Subrahmanyam, Velcheti (2 February 2012). "Master holds in hypnotic spell". The Hindu. Archived from the original on 8 February 2012. Retrieved 18 February 2012. ^ a b "French honour for Balamuralikrishna". The Hindu. 3 May 2005. Retrieved 2 November 2012. ^ "Balamuralikrishna deserves Bharat Ratna: Jayalalithaa". The Hindu. 26 July 2005. Retrieved 16 November 2013. ^ Kolappan, B. "Carnatic musician Balamuralikrishna passes away". ^ "Mangalampalli can't wait to come home". The Hindu. 1 March 2003. Retrieved 2 November 2012. ^ "Music for rains". The Hindu. 26 July 2012. Retrieved 24 July 2015. ^ Sundaram, BM (26 October 2011). "A prodigy and a genius" (PDF). ^ a b Subramaniam, Garimella (6 July 2004). "A musical colossus". The Hindu. Archived from the original on 6 June 2011. Retrieved 2 November 2012. ^ a b "Carnatic singer M Balamuralikrishna passes away in Chennai, Venkaiah Naidu offers condolences - Firstpost". 22 November 2016. ^ a b "Veteran Carnatic musician M Balamuralikrishna passes away at 86". 22 November 2016. ^ "Dr. M. Balamuralikrishna - Biography & History - AllMusic". ^ "The singer who took on N T Rama Rao". The Times of India. 23 November 2016. Retrieved 24 November 2016. ^ "Balamuralikrishna, veteran Carnatic musician, dies aged 86". The Times of India. 22 November 2016. Retrieved 22 November 2016. ^ "M Balamuralikrishna, Carnatic Music Legend, Dies at 86 - NDTV Movies". ^ a b "Padma Awards Directory (1954–2014)" (PDF). Ministry of Home Affairs (India). 21 May 2014. Archived from the original (PDF) on 15 November 2016. Retrieved 22 March 2016. ^ "State Film Awards". Department of Information and Public Relations (Kerala). Archived from the original on 19 November 2009. Retrieved 23 November 2016. ^ "Adaminte Makan Abu adjudged best film". The Hindu. 23 May 2011. Retrieved 23 November 2016. ^ "Sangeet Natak Akademi Puraskar (Akademi Awards)". Sangeet Natak Akademi. Archived from the original on 17 April 2010. Retrieved 23 November 2016. ^ "Recipients of Sangita Kalanidhi". Madras Music Academy. Archived from the original on 4 March 2016. Retrieved 23 November 2016. ^ a b Kumar, Raj (2003). Essays on Indian Music. Discovery Publishing House. p. 204. ISBN 978-81-7141-719-3. ^ a b "Awardees of Sangeetha Kalasikhamani". Indian Fine Arts Society. Retrieved 23 November 2016. ^ "'Sangeetha Kalasarathy' conferred on Balamuralikrishna". The Hindu. 17 December 2002. Archived from the original on 25 October 2003. Retrieved 23 November 2016. ^ "Maestro enthralls audience". Indian Weekender. 13 October 2009. Retrieved 23 November 2016. ^ "Award for Balamuralikrishna". The Hindu. 21 September 2011. Retrieved 2 November 2012. Swaminathan, Chitra (4 January 2008). "He defines 'style' as tradition". The Hindu. Archived from the original on 12 May 2008. Khurana, Suanshu (2 September 2013). "God's Own Voice". The Financial Express. Archived from the original on 5 March 2016. 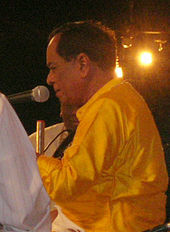 Wikimedia Commons has media related to M. Balamuralikrishna.